Beautiful Crystals Hearts with engraved messages ready for you to gift. A very pretty blue heart-shaped crystal would make a lovely gift. 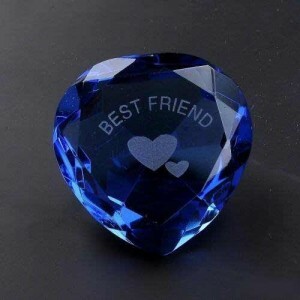 This crystal features engraved Hearts as pictured, and says "BEST FRIEND". For that special Best Friend! Size: 50x40mm. Crystal hearts gift boxed.